Most people think of wedding themes as crazy stuff, like wearing outlandish costumes and putting up make-believe props on their wedding day while others think they are only for movies. A wedding theme can actually be just about color like “All things Baby Blue” for my own wedding. My husband and I both loved Baby Blue and color themes were popular during our time. A wedding theme may need much budget, but not always especially when you get creative. The rule of thumb is, always stick to what you can afford. A creative wedding theme can be crazy or sophisticated, or both. It can be bold like marching down the aisle in a cute gown and a pair of sneakers, or subtle like having things color-coordinated like invitation envelopes and venue decorations .You can have it extreme or just a tweak to create focus – the one important thing I usually look for when organizing or coordinating a wedding event because it makes things easier to plan and put together. 1. Tropical Affair. When I think of this theme a bunch of leis easily comes to mind, plus a lovely bride with tropical flowers on her hair. Definitely the easiest theme to coordinate and put together because even guests love to dress the part. And take note, this is one theme where things look amazing on photos. You can hold tropical weddings on a beach or at a poolside. Sunset is an excellent time so you can have Tiki torches along the aisle. When such is not possible, just dress your venue to fit in. You may complete the set with beach lanterns and coconut centerpieces at the reception hall and acoustic guitar on the background. 2. High School Crush. Nothing compares to feelings for a high school crush. Relieve the experience by going with a high school life wedding theme. You can actually hold this at a school campus, or create scaled-down replicas and transform your venue into a school. You may choose to let guests dress the part or just the two of you plus your entourage, for effect. This creative wedding theme is possible with little budget making it perfect for cost-conscious couples. 3. Princess Wedding. Who says princess themes are just for little-girl birthdays. Wear a lovely ball gown complete with a cute crown, a pair of gloves and glass slippers. The wedding venue should go with it so hire an interior decorator who can set up a scaled-down kingdom background for you (3-D would be good). Your parents can play kings and queens which I’m sure they will love, and your groom is prince, of course. The wedding car can be a royal carriage, and you can have court guards and a clown to complete the set. I know you are asking about the veil and trail. You can still wear them, too. 4 . Street Romance. The coolest theme one could ever have, perfect for the hip-hop type. In case you’d want to know, you could be in your wedding gown – and a pair of groovy sneakers. A friend had this for his wedding. The couple made it special by having their guests dress up in formal black and white, while they both wear wedding clothes and groovy sneakers. Just plain super cool and creative. They held it by a quiet roadside using street corners and junctions as their background. One of the cutest and most creative wedding themes I ever saw on photographs. 5. Destination Wedding. This is getting popular – at least to the more adventurous types. You and your guests go to a destination place and hold your wedding there. Destination weddings have their plus, but also their drawbacks. They are not for the fainthearted because they mean huge expenses, but they may still be worth it especially when you are planning a post-wedding vacation with family and friends. You will need plenty of creative planning and coordination but when done perfectly, it can be a very fun and intimate affair for just a few chosen people close to your heart. 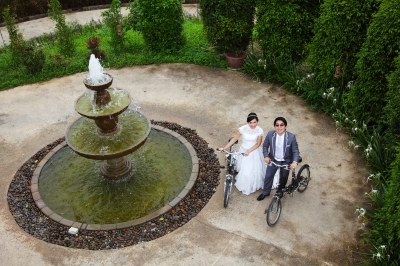 You don’t have to spend tons of money to have a lovely and memorable wedding. It just takes a bit of creativity in maximizing what you’ve got. For more creative wedding themes, follow this blog, like my page on Facebook or contact me. Also, share your creative wedding ideas here and let us discuss.